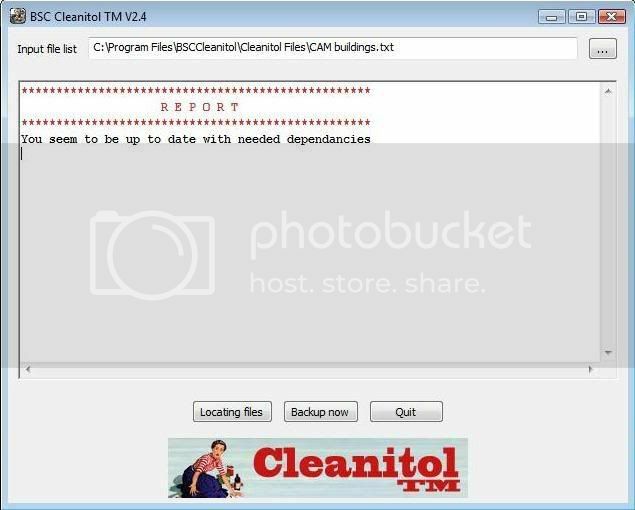 Using Cleanitol is absolutely the easiest way to make sure that your Plugins folder is in it's best shape possible. Installation is quite easy, just be sure to read the installer as you go. File "BSC Cleanitol TM.py", line 2, in ? File "wx\__init__.pyo", line 45, in ? File "wx\_core.pyo", line 4, in ? For easy reference, I suggest creating two new folders within your Cleanitol folder, usually C:\Program Files\BSCCleanitol, unless you changed the directory during the install. Name the first Removal, the second Dependencies. This will help you sort out the cleanitol files, and keep track of them, should you need them again at some point. There are two that I recommend using somewhat regularly, depending on your download frequency: the Cleanup list, and Remove Landmarks Growing on Empty Lots file attatched to RippleJet's first post here. Make sure you have the most recent edition of each. Remember that you need to run Cleanitol on your Plugins folder in it's pre-DatPacked state. Also, Cleanitol only looks for files located in your Docs/SimCity 4/Plugins folder, so you may want to move over any plugins you have in your C:\Program Files\Maxis\SimCity 4 Deluxe\Plugins folder over, to make sure that all of your files are scanned. There are 2 ways to open a file to start scanning. You can open the program, and click on the ... button next to the Input file list area, and search through your hard drive for the correct file. Or, you can simply drag the Cleanitol directly from whatever folder you've saved it to, onto the handy shortcut on your desktop. You did keep that on the desktop right? Let's start with something easy, the Cleanup list. Click on Locate Files to see what we've got. Ouch. Been a while since I ran that one. So many files needlessly cluttering up my Plugins folder. Time to take care of that. Click on Backup Now, and get those out of the Plugins folder. Now all of those files have been safely moved outside of the plugins. But wait, wasn't there a ReadMe in there? That might be important. Better hang on to that. Go ahead and look in your Docs/SimCity 4/BSC_Cleanitol/ folder and see what all has been moved. Remember, just because it shouldn't be in your Plugins folder doesn't mean you won't need it. Never know when you might need to check a ReadMe again. That was fun, let's do another one. This time the Cleanitol Remove Landmarks Growing on Empty Lots file, to get rid of all of those awful empty lots growing all over the place. Doh! Look at all of those. They have got to go! I probably should have followed the directions for the CAM dependencies lists, and only installed the sc4model files, huh? Oops, forgot to demolish them all before I did that. Not a problem. All I have to do is use the undo.bat in my Docs/SimCity 4/BSC_Cleanitol/20080210_02 folder. Or if you know the name of the file you need, you can move it back to your plugins folder manually. Now I can safely demolish all of those horrible lots. Then run the Cleanitol again to make sure they're gone for good. Since all files are safely moved to the BSC_Cleanitol folder, you can play your game a while to make sure you won't need the files before deleting them completely. But I keep getting these blasted brown boxes all over the place!!! Somebody help!!! Maybe I forgot to download something? I'd better check for dependencies. Probably should start with the Mega Packs. I seem to be missing dependencies. Luckily, all I have to do is click on the links provided to get them. If that doesn't help, you can always check the Get Your Cleanitols for Free thread . This of course is the message you REALLY want to get. Ahhhhh!!!! My cat jumped on my mouse and clicked on Backup Now!!! All is lost!!! Not quite. All you have to do is look for the undo.bat in your Docs/SimCity 4/BSC_Cleanitol/YYYYMMDD folder, and restore the files, back to the folders they came from. But as long as the Cleanitol file was made correctly, only the files that needed to be removed have been. How long should I keep the files in my Cleanitol folder before I delete them permenantly? Really, it depends on the file in question. If it's a sc4model file that's been included in a Mega Pack, then it should be safe to delete the file immediately. You may want to open a city where you've used that model to make sure though. If you get a Missing Plugin Error, or a brown box where there wasn't one, you'll need to restore at least that one file to your Plugins folder. If it is a lot that has been included on a Removal file, you can safely delete it as soon as you are sure that all instances have been demolished, and that the new lot is functioning as it should. Again, if you get a Missing Plugin error, you'll need to move the file back into your Plugins and demolish all instances of the lot. If it's a mod of any sort that has been updated with a new & improved version, make sure that the new one works the way you think it should. If you have any problems at all, you can revert back to the one you're used to. Excellent work, xxdita! And fun to read as well! ... Or, you can simply drag the Cleanitol directly from the zip it came in, or from whatever folder you've saved it to, onto the handy shortcut on your desktop. You did keep that on the desktop right? Great work!! both needed and well written! JRJ - Link fixed to point to RippleJet's first post in that thread. The Remove Empty Lots file is attatched, but we have been changing the filename rather frequently this week as we find more. In the 3rd picture, I used one of the Mega Pack Cleanitols done by Capo. But I need to update that, as a lot can happen within 3 months, and add it to the Cleanitols for free thread (link in my sig). Thank you for your help with the Spanish translation. Perhaps someone could volunteer to translate into other languages for the rest of our international friends? Okay, NAM says to run the Cleanitol file before installing the NAM. Is that true for all of the remove lists that come with other mods/props/etc.? But, after installing NAM, what happens if I install something later that the NAM cleanitol removed. Do I have to remove NAM periodically to rerun the cleanitol file? In most instances, you'll only need to run a Remove Cleanitol one time, before installing, which is why the Cleanitols are included outside of the installer, along with the ReadMe. If you run the Cleanitol after installing, it may just remove the lots you've just installed, if the filenames weren't changed as the lots were updated. With NAM, the main thing is making sure you are using the most recent release, as it is the only one that comes with any support. On the LEX, all outdated versions are locked or replaced, for this reason. I still get this message after I installed the two dll files you mentioned. This from the CAMeLOT_Dependencies_070731 list. Also when I scan my hard drive I find that gdiplus.dll is located in quite a few places. I am wondering if there is another file I could use. Where can I get that file named: "empty RCI Lots.txt", to get from those empty lots? Hey hello! I just installed Cleanitol and used it! Does quite a good job except for the fact it creates double copies of different tools in game menu. E.g the icon of the tool to build RHW apears twice! Why? Can there be sth done pls! It's very confussing and annoying! Thanks in advance! I am going to cry, literally. I downloaded it. got the files you told me to get. doesn't work. Can anyone help? I haven't had a good day so any help would make my day. I keep getting a message saying "See the logfile 'C:\Program Files\ BSCCleanitol\BSC Cleanitol TM.exe.log' for details." The problem is that I have no idea what it means and it's not working and I just want the new NAM. Mush love, Jezus53. Hey, my first post here. Nevermind. The MSVCR71.dll that cam with the program wasn't what I was supposed to put in the system 32 folder. Dumb mistake. Oh well. thank you for the great tutorial. somewhat related, not too long ago there was discussion about a generic utility that looked for file duplicates on your entire hard drive. silly me never clicked the link, and now i am unable to find it. ps- apologies for being such a lurker- im still working my way through the tutorials, and so seldom feel i have anything to contribute. i have the same question, where do we get this file name? Page created in 0.37 seconds with 113 queries.